A driver was attempting to turn south onto Main Avenue from East College Drive when he struck two pedestrians in the crosswalk in 2013. According to the Colorado Department of Transportation, 93 pedestrians were killed in Colorado in 2017, up 11 percent from 84 pedestrian fatalities in 2016. The number of pedestrian fatalities in the United States has grown substantially faster than all other traffic deaths in recent years, including in Colorado where pedestrian fatalities reached an all-time high in 2017, according to the Colorado Department of Transportation. CDOT reports 93 pedestrians were killed in Colorado in 2017, up 11 percent from 84 pedestrian fatalities in 2016 and 45 percent from 2015 when 64 pedestrians died. 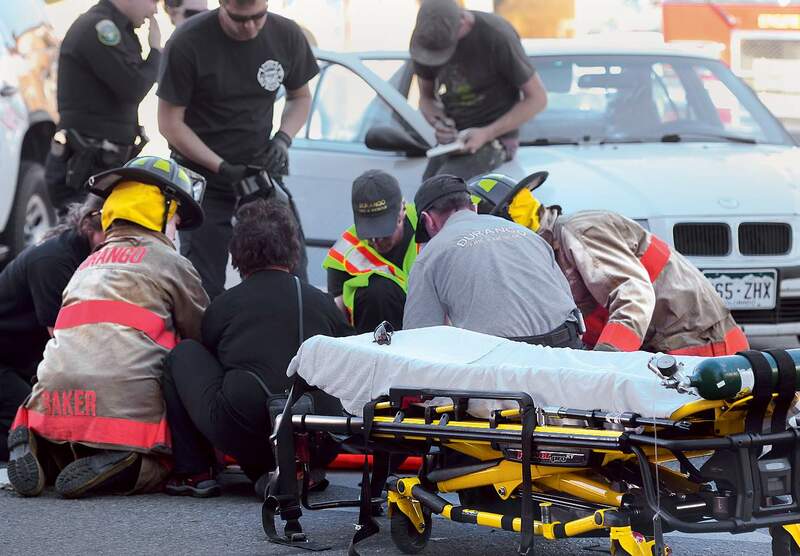 Scott Sholes, emergency medical services chief for Durango Fire Protection District, said EMS staff members responded to 17 pedestrian accidents in 2017, and three so far this year. Two pedestrians were killed in March 2017 along Main Avenue near 21st Street after a vehicle jumped a curb and hit them on the sidewalk. The driver was charged with two counts of careless driving resulting in death. On average, EMS staff respond to about 15 car crashes involving pedestrians every year, Sholes said. Pedestrians represented 14 percent of all traffic fatalities statewide, according to a news release from CDOT. Cole said both drivers and pedestrians can be responsible for pedestrian fatalities, but more blame rests on the driver because pedestrians are incredibly vulnerable. The majority of pedestrian fatalities don’t occur in intersections, Cole said. Pedestrians crossing the road mid-block are more likely to be hit by vehicles. Main Avenue is a reoccurring spot for car crashes involving pedestrians, Sholes said. He said another common crash scenario involves two lanes of traffic traveling in the same direction, such as on Main Avenue. “One car will stop and block the vision for the other car traveling in the same direction,” he said, adding he has investigated several fatalities that happened under this circumstance. Sholes said pedestrians should never assume a driver is going to stop.